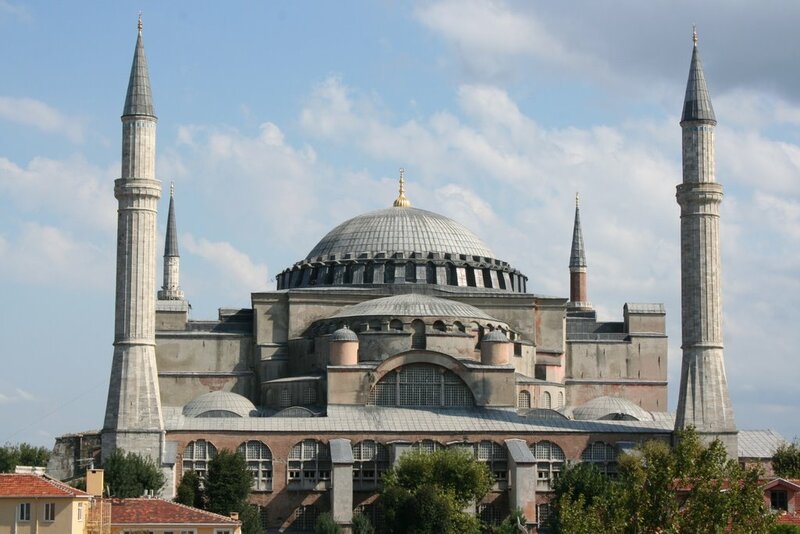 Aya Sophia was built, for nearly a thousand years ago, is the largest enclosed space in the world, and still seen as one of the world's most important architectural monuments. It is one of Turkey's most popular attractions, drawn by the sheer spectacle of its size, architecture, mosaics and art. It used to be a church for 916 years, then a mosque for 481 years, and since 1935 has been a museum. Thought to have been constructed by Emperor Konstantinos I (324 – 337) it was burned down during a revolt. Rebuilt by Emperor Theodosium II, it was opened for worship in 415 and once again was burned to the ground, during the Nika revolts of 532. Emperor Iustanianus (527 – 565) wanted to construct something even bigger than the original two and appointed architects Isidoros from Miletos, and Anthemios from Tralles to build the Aya Sophia which still stands. Columns, heads, marble and coloured stones were imported to Istanbul from ancient cities in Anatolia for the purpose. The construction began on 23 December 532, and was completed exactly five years later. The main, central section measured 100m x 70m, covered with a 55m high dome which was a mammoth 30m in diameter – appearing to be a great feat of design. The mosaics are of great importance, and the oldest ones are dominated by geometric and plant motifs decorated with gold. The worst desecration of the church was in 1204, ransacked by Catholic soldiers during the Fourth Crusade. In 1453, after a failure of the Byzantine Church to fend off the Turks, Mehmet the Conqueror captured the city, rode into Aya Sofia and immediately turned it into a mosque. It was repaired several times, and Islamic ornamentation added, for example an extract of the Koran by calligrapher Izzet Efendi inscribed on the dome. The other reminders of its previous status as a mosque include huge wooden plaques bearing the names of Allah, the Prophet Mohammed and the first four caliphs. The marble and mosaics remain the most interesting aspects today. The columns supporting the gallery are made from antique marble, and in the western gallery is the green marble which marks the position of the throne of the Empress. The impressive figurative mosaics include Virgin and Child flanked by two emperors, dating back to the late 10th century, and one depicting Christ, the Virgin, and St John the Baptists. Even though there is partial damage, the haunting images on their faces remain as strong as ever. 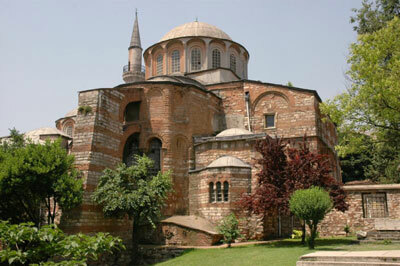 This ranks as the first church built in Istanbul. It was commissioned by Constantine in the 4th century, and Justinian later had it restored. The building reputedly stands on the site of a pre-Christian temple. Built in 1524 by İbrahim Pasa, the Grand Vizier to Suleyman the Magnificent, this was originally a palace and the grandest private residences in the Ottoman Empire – and one of the few which have survived. Some of it, however, was destroyed and rebuilt in stone to the original designs in 1843. Now home to the museum, this is considered one of the finest collections of Islamic art in the world, with a superb display of ceramics, metalwork, miniatures, calligraphy and textiles, as well as some of the oldest carpets in the world. Equally as impressive is the grace of the building, with the central courtyard giving something of an insight into the atmosphere of the residence. Opposite is the Great Hall, which houses a collection of Turkish carpets, with exquisite antique carpets and kilims and one of the finest collections in the world, the oldest exhibit dating back to 13th century. The Mosaic Museum preserves its situation exceptionally fine 5th and 6th century mosaic pavements from the Grand Palace of the Byzantine emperors. Because of the way they are exhibited, it is easy to understand their size and scale especially because many of them can be viewed from a catwalk above. This is actually Kariye Mosque, once the 11th century church of St Saviour in Chora, is considered to be the most important Byzantine monument in Istanbul, after Aya Sofia. Whilst unremarkable in its architecture, the interior walls are decorated with superb 14th century mosaics. Illustrating scenes from the life of Christ and the Virgin Mary, these brilliantly colored paintings embody the vigour of Byzantine art. The restored wooden houses in the surrounding area are a good place for relaxation and refreshment. The church was probably built in the early 12th century, of which only the nave and central apse remain. Theodore Metochites rebuilt it between 1316 and 1321, the same years from which the mosaics and frescoes date, which depict the life of Christ in picture-book fashion. There is a series of mosaics in the form of devotional panels in the narthexes, the theme of which is reflected in the frescoes in the nave and funerary chapel. 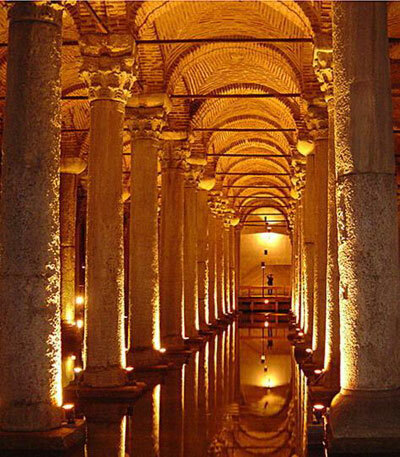 Nearby Aya Sofia is the 6th century Byzantine underground Basilica cistern, with 335 massive Corinthian columns supporting the immense chamber's fine brick vaulting. This is one of several buried into the city's foundations, and the first to have been excavated and renovated. Thought to have been built in the 4th century by the emperor Constantine, then enlarged two centuries later, it was supplied with water from Belgrade Forest, amd supplied it to the Great Palace and Topkapi Palace. It fell into disuse and was then restored in 1987 with the mud and water removed, and narrow raised pathways providing easy access for visitors. It is the largest covered cistern in the city, measuring 140 by 70 metres. The Aviation Museum in Yesilkoy traces the development of flight in Turkey. Highlight of this museum is definitely the Mehter Takimi, the Ottoman military band, which performs every afternoon between 15.00 – 16.00. It also has a good collection of Ottoman military memorabilia, like the cotton and silk tents used by the sultans at war, and armour and weaponry like heavily decorated jambiyah daggers. The band, which originated in 1289, became an institution which came to symbolise the power and independence of the Ottoman empire, and these musicians, who were janissaries, always accompanied the Sultans into battle. But quite apart from their benefit on the battlefield, they came to create new musical styles in Europe, and even influencing Mozart and Beethoven. Opening hours: 09.00 – 17.00, closed Mondays and Tuesdays. The collection is divided into two buildlings: The one facing the water has seagoing vessels, and the one opposite the road has exhibits relating to maritime history of the Ottoman Empire and Turkish Republic. Highlights include items from Ataturk's yacht, the huge wooden figureheads of tigers and swans, and the imperial caiques of the sultans, the largest dating back to 1648, which needed 144 oarsmen to power it. Opening hours: 09.00 – 12.30 & 13.30 – 17.00, closed Wednesdays and Thursdays. Ataturk's former residence in Şisli, 2 km from north of Taksim Square, now serves as the Ataturk Museum and displays his personal effects. The grand imperial caiques used by the sultans to cross the Bosphorus are among the many many other interesting exhibits of Ottoman naval history that can be seen at the Naval Museum located in the Besiktas district. Open days to visit: Everyday except Saturday and Sunday. Museum of Fine Arts This collection is in the east wing of Dolmabahce Palace, once the apartments of the heir to the throne. Although closed for some time following damage after the 1999 earthquake, it is best known for its late 19th century and early 20th century work, which gives an insight into the life of the late Ottoman Turks. Osman Hamdi is one of the best artists exhibited. Opening hours: 12.30 – 16.30, closed Mondays and Tuesdays. Located inside the gardens of Yıldız Palace, this museum preserves and documents the history of Istanbul since the Ottoman conquest, including ornaments and paintings from the 18th and 19th centuries reflect the way of life. Also within the gardens are the Yildiz Palace Theatre, and the Yıldız Sarayı Theatre (Museum of Historical Stage Costumes), with richly decorated scenery, stage and costumes. Also exhibited are portraits of some of the stars who appeared here, including Sarah Bernhardt. Opening hours: 09.00 – 16.30, Closed Mondays. The museum is set in an Ottoman-period building, an 18th century factory which produced anchors and their chains. It was recently converted, although has retained many of its original features, and restored by Rahmi Koc, who is one of Turkey's most powerful industrialists. It was essentially done so he could house his private collection of models, machines and vehicles which he had collected from all over Europe, and exhibits include original penny-farthing bicycles, a ship's bridge, and an engine from the Kalender steam ferry. The museum is trying to raise the Australian navy's first submarine sink of gallipoli in World War I. Opening hours: 10.00 – 17.00, closed Mondays. Up the Bosphorus and shortly before Buyukdere, the collection of an Armenian civil servant fills two charming 19th century wooden villas. The larger of the two villas belonged to the Armenian, who became a politician and died in the great Beyoglu fire in 1922. His collection was put together in memory of Sadberk Hanim, wife of millionaire businessman Vehbi Koc. A private museum which originally displayed only Turkish decorative arts, was recently expanded to include a new collection of archeological exhibits. This is the oldest section, and includes sixth-millenium BC mother goddesses. In the ethnography section, there are maternity and circumcision beds, clothing and jewellery. Opening hours: 10.00 – 18.00, closed Wednesdays.